In 1765, Britain's Queen Charlotte ordered a Wedgwood tea set and liked it so much that she allowed the creamy, hard-glazed body from which it was made to be known henceforth as Queen's ware. Over the next century, Josiah Wedgwood and Sons dominated the market in inexpensive, durable yet refined tableware, making everything from dinner services to jelly molds to the first oven-proof containers. They are best known for their blue jasper and black basalt ware, with raised motifs in imitation of antique hardstone cameos. Almost all their wares are clearly marked, but the buyer needs to beware cheap imitations. Examine the body to see whether it is porcelain or, as with most Wedgwood, a variety of earthenware. Wedgwood earthenware is marked as described below in Steps 2 and 3. 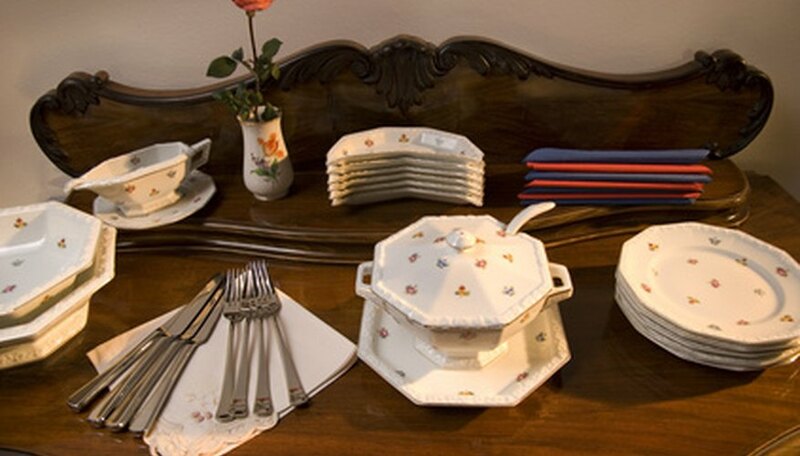 Since 1878, Wedgwood bone china has been stamped with a printed symbol of the Portland Vase. From 1900, three stars and the words “Made In England” were under the vase, then in the 1920s “Bone China” was added. From the 1960s, a line appeared at the bottom of the printed mark. A piece of bone china with impressed marks is very unlikely to be Wedgwood. Look at the base for the impressed name “Wedgwood.” If it is stamped in individual lowercase letters, that points to a date before 1769, but usually it will be in capitals. If you see the word “England,” that dates the piece to after 1891. Pieces marked “Made in England” belong to the 20th century. If you come across a piece of earthenware with a printed mark, it is probably not Wedgwood. Search the base for a three-letter sequence. This is a date code that appears on all Wedgwood earthenware after 1860, lasting with slight variations into the 1930s. By consulting such books as “The Encyclopedia of British Pottery and Porcelain Marks,” you will be able to discover the exact year of manufacture for your item. In the 1940s, a simplified two-digit date code was introduced (such as “52” standing for “1952”). The absence of any date codes should give you cause for concern. Watch out for the wares of “Wedgwood and Co” and “Wedgewood” with an “e.” These are entirely separate companies. Out-and-out fakes also appear on the market, but they are no match for the originals in quality.